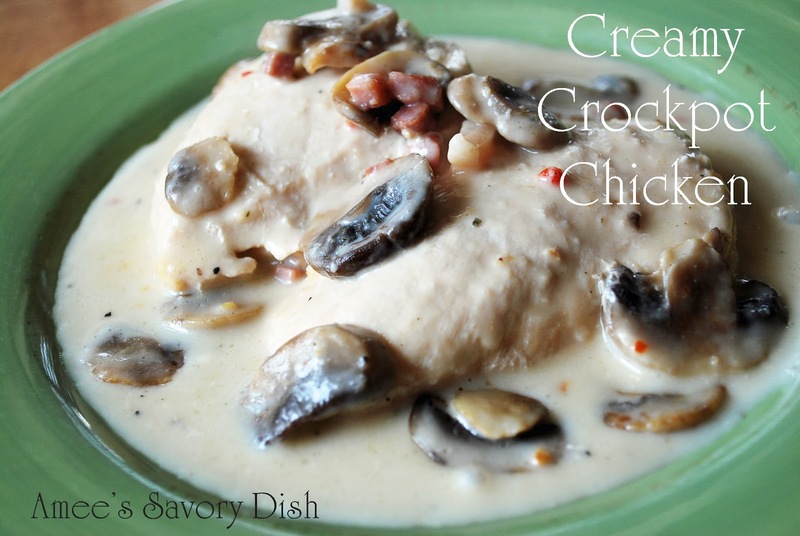 This Creamy Crockpot Prosciutto Mushroom Chicken is one of my kid’s favorite recipes. They love all of the extra “gravy” that this recipe makes to pour over their chicken and rice. It’s fast, delicious and cooks while you go about your day. A perfect dinner for busy parents. In a large sauté pan, cook pancetta (or prosciutto) on medium heat until lightly browned and fat is rendered. Remove pancetta with a slotted spoon and set aside. Add chicken breasts to the pan drippings and turn heat to medium-high. Brown both sides of the chicken breasts and place in a slow cooker, sprinkling the pancetta on top. Drizzle remaining pancetta drippings over top and sprinkle with the seasoning packet. Pour broth on top. Cover and cook on LOW for 3-4 hours. In a small mixing bowl, blend cream cheese and soup until smooth. Stir in mushrooms. Pour cream cheese mixture over chicken. Cook 1 to 2 hours longer or until chicken juices run clear; stirring once half way to prevent burning around the edges. Serve over brown rice. In a large sauté pan, cook pancetta (or prosciutto) on medium heat until lightly browned and fat is rendered. Add chicken breasts to the pan drippings and turn heat to medium-high. Brown both sides of the chicken breasts and place in a slow cooker, sprinkling the pancetta on top. Drizzle remaining pancetta drippings over top and sprinkle with the seasoning packet. In a small mixing bowl, blend cream cheese and soup until smooth. Pour cream cheese mixture over chicken. Cook 1 to 2 hours longer or until chicken juices run clear; stirring once half way to prevent burning around the edges. « Flavor Your Water To Drink More H2O! I love recipes like this, simple and flavorful.